A final flowering of Indian court painting took place in the Punjab Hills in the late 18th century. 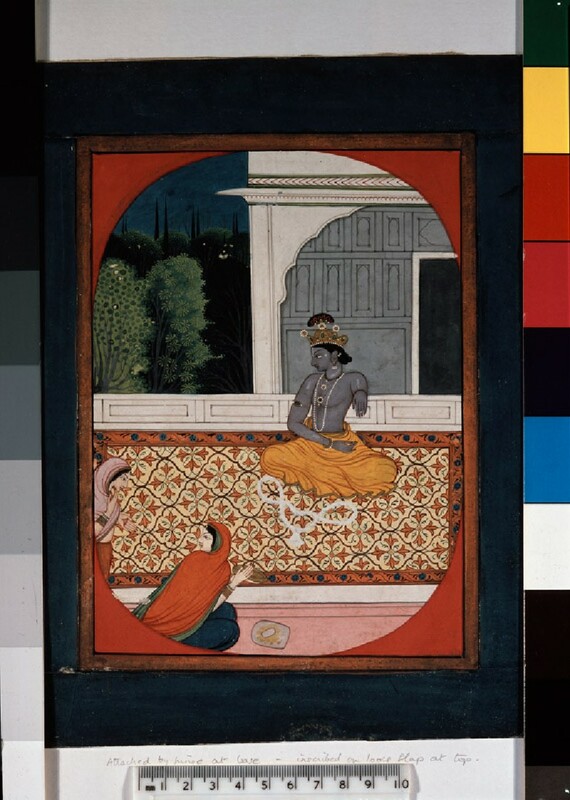 The renewed assimilation of Mughal pictorial conventions to the lyrical Rajput style had given rise to a mellifluous and romantic style of manuscript illustration. Among the most popular texts were those describing the youthful exploits and loves of Krsna, such as the Bhāgavata-Purāṇa and Gīta-Govinda, poetical treatments of the emotions of idealized lovers (often personalized as Kṛṣṇa and his mistress Rādhā), such as the Rasikapriyā of Kesav Dās and the Sat Saī of Bihārī Lāl. Through the mobility of the artist families of the new style soon became widespread throughout the Hills, though its classic phases are associated particularly with the courts of Guler and Kangra. By the early 19th century the first inspiration had waned and the sweetness of the style had started to become cloying and mannered. The Garhwal painting from a series of the Sat Saī shows signs of transition. The subject is a typical literary conceit (Ratnākar ed., no.405): Kṛṣṇa, overcome by love, has enshrined the tender maiden (Rādhā) in his heart and now discards his flower garland and camphor and sandal-paste unguents, lest their weight should oppress her. The cast-off garland lies on a carpet before him and the maidservant’s sandal-crushing board remains unused. Kṛṣṇa gazes away in distraction while the two maids exchange a wondering glance. This treatment of the theme is evidently later in date than the version published by Randhawa, being more stiffly and nervously executed.